Calligraphy Workshop with Jen Maton — Campfire & Co.
Campfire & Co. is so excited to kick off our GOOD VIBES ONLY workshop series with Jen Maton of If So Inklined! Master of lettering, Jen will be teaching a 101 course on the pointed pen calligraphy at our studio on February 27th from 1 - 4pm. This 3 hour workshop was designed by Jen to start you on the path to learning one of the most popular art forms. 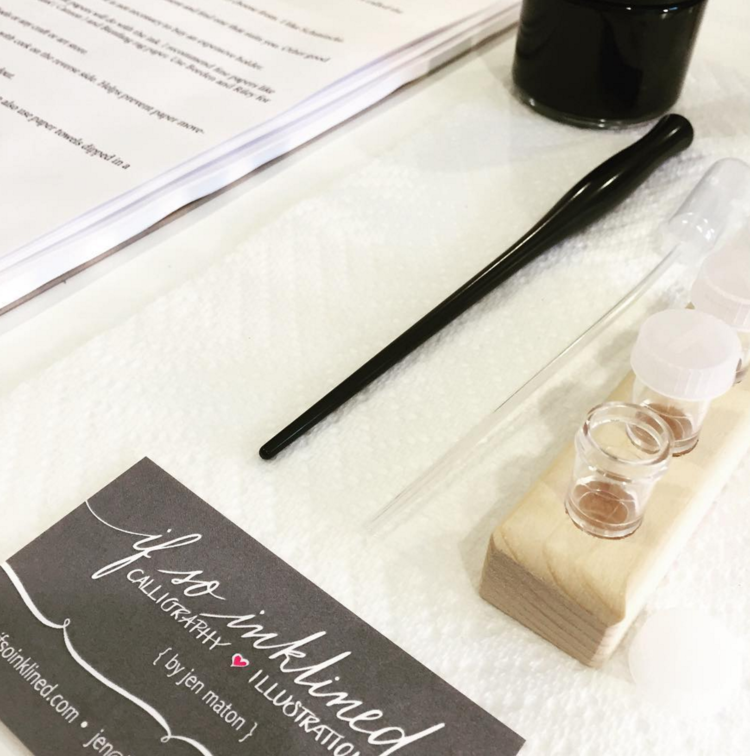 In the workshop you will receive a beginners level starter kit, tote bag, light snacks and beverages, and an array of valuable insight from a professional calligraphy artist! You can sign up for the workshop on Jen's website here. Tell us a little bit about your story to becoming a calligraphy artist. I started my love for calligraphy at the age of 12 when my parents gave me a Shaffer pen set and a pad of colorful paper. I began by teaching myself -- practicing on thank you note envelopes for my friends and family. That love eventually landed me in college for art and graphic design, where I learned in depth calligraphy, illustration, painting and computer graphics. My career began as a graphic designer for an ad agency in Nashville, TN., later landing a job in Greensboro NC as a Senior Designer for Carson Dellosa Publishing Company. I designed everything from book covers, stickers, packaging, catalogs, art — you name it I worked on it! Once I started a family, I realized how much I missed calligraphy and with 3 small children I needed flexibility in my work schedule. With a little nudge from my husband, I opened up If So INKlined Calligraphy and Illustration in 2003. Over the years I have grown as a calligrapher while working with numerous event planners and designers. I currently have a full calligraphy suite in the Arzberger Stationery Album that is in over 400 stores across the US. I have a downloadable calligraphy font out for sale on MYFONTS.com and one that will be released in the next month. I hand lettered and illustrated artwork for the “Make It Easy” Holiday Magazine for Walmart World. Recently I did all of the magazine calligraphy for Wine and Country Weddings and The Scout Holiday Gift Guide. Over the years I have worked with Monticello and countless numbers of companies on logos. I am currently in negotiations with 43Layers on designing laser cut cake toppers. I have also been featured in Weddings Unveiled Magazine, Martha Stewart Magazine, The National Knot Magazine, Southern Bride Magazine, Style Me Pretty Blog, Grey Likes Weddings Blog, 100 Layer Cake, and many more! 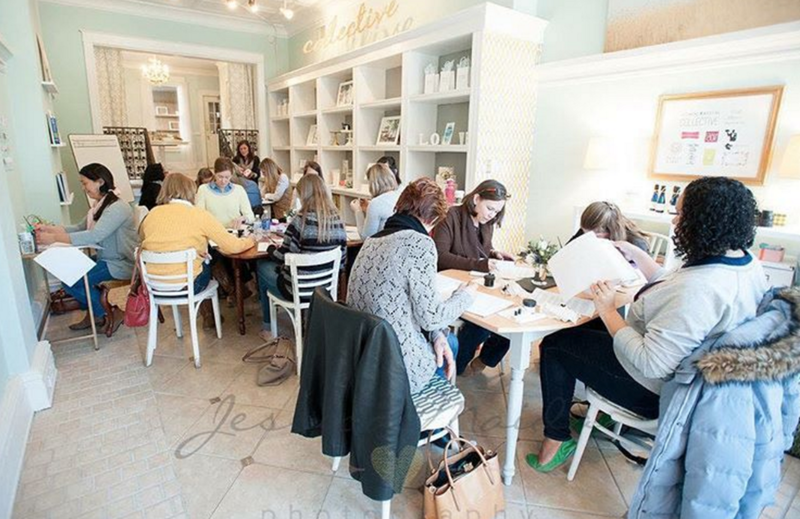 I have been teaching calligraphy for almost 2 years now up and down the east coast. I simply want to share my love for this art with anyone who desires to learn! If you had to choose, what would you say you love most about calligraphy? I love the way the pen dances on the paper. It truly is relaxing and creative. I also love the fact that I can take this old world art form and use it everywhere even in a digital world. Nothing is more beautiful then receiving a hand calligraphied envelope in the mail! It’s hard to pick a favorite project— SO MANY!! I am currently working on an art show for The Artbox in Crozet, VA. That has been a lot of fun being able to create real art for a show. But I have to say everything I create is fun because every day is different. I always have requests for a variety of projects, which keeps things interesting and exciting! Ahhhh! 2016 is going to be the best year yet for If So INKlined! I can’t share too much, but I am working on something that will help other fellow calligraphers. STAY TUNED!! What are a few of your favorite things to do in Charlottesville? Charlottesville is great because it has everything from historical sites to gorgeous wineries to great restaurants. My favorite place to eat out is The Local-- fresh, local ingredients! I also enjoy taking a stroll at the Downtown Mall. But most importantly I love spending time with my family! We can't wait to glean the skills of this master calligrapher! Thanks again Jen for sharing your story and collaborating with us to bring this workshop to Richmond! Don't forget to reserve your spot for the workshop before it sells out!